The elegant chocolate rose rested on my plate, smiling up at me, taunting me. I’d come home from work, and there it was, my rose valentine, tied with shiny red ribbon to my door knob. No message. I frowned, puzzling through my very short list of possible admirers. Work? Hmm, three women, all married, and one fifty year old, single man. Oh Jesus. I felt myself go pale. Jesus, please don’t let it be him, I prayed with true sincerity. His huge tombstone like front teeth, yellowing with age, always widened to super beacons whenever I entered his office. Sitting in my chair wasn’t enough. This deserved some serious pacing. I nibbled at my bottom lip. Stop doing that. Last time I’d drawn blood and my lip had become infected. Remembering the way people had murmured sympathetically about cold sores, while keeping their distance, I obeyed my stern mental order. Snatching up the rose, I glared at it as I paced. “No,” I said in horror, “Bob can’t have sent you to me.” Bob. My boss. Way, way, way overweight. Lives with his mum. I thought he was gay. No it can’t be him. But panic was starting to set in. Picking absently at the red foil enclosing the chocolate rose as I paced with increasing desperation, little flashes of Bob came back to me. Chortling loudly over a dumb joke I’d made at the last meeting. Offering me a lift home when the meeting went late. Oh God. Red foil fluttered to the ground. His eyes. I’d always thought they were avuncular, like a dad would look at his favourite daughter. Oh God, oh God. I brought the now naked rose up to my lips and nibbled. Anger replaced my shock. “What does he think he’s doing?” I asked the now gnawed-at rose. “Good grief, your owner is crazy. I’m only twenty-four. He knows that.” Another memory shook me. I’d told Bob I was between guys right now. I took a huge, furious bite and was left with the green stem. I ignored the delicious, creamy, chocolate sliding seductively around my mouth. Narrowing my gaze at the door, I stiffened my shoulders, took a deep breath, and stalked towards it. Okay, Bob, you’re my boss. Fine. But you have crossed a line. I flung the door open. Oh. Not Bob then. A guy stood on my doorstep. Black jeans, button-down white shirt. Tall. I raised my eyes from his broad chest up to his face. Handsome, in an easy-going, fun way. Curly brown hair. Sprinkling of freckles. Nice nose. I like nice noses. Then my eyes met his. Blue. Smiling. Shy. “Um, hello?” I said blankly. 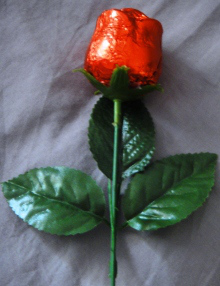 This entry was posted in Flash Fiction and tagged chocolate, romance, romantic flash fiction, valentines day. Bookmark the permalink.